With a lot of excitement I put the Bia on my wrist. 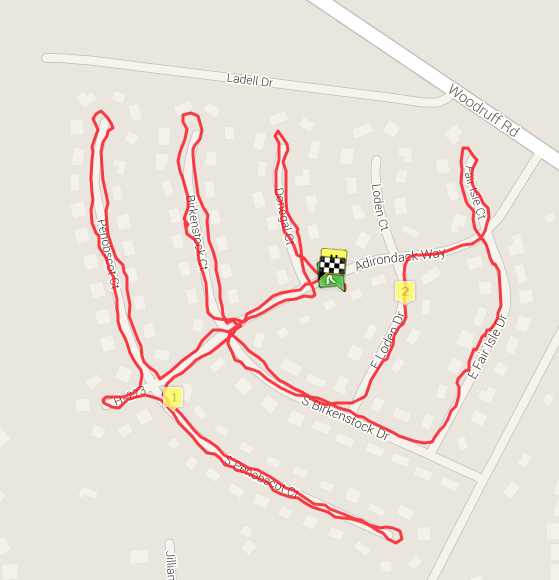 To give it the fairest shot, I decided to try it out on my 2 mile neighborhood run. This is on paved roads in suburbia with pretty much no tree coverage. I had read numerous blog entries about the accuracy prior to purchasing. They all raved about it and one even showed how it was used on an actual track which is historically difficult for GPS units. The Bia had picked up which lane they ran in and it was all very exciting. I laced up my shoes and headed out. This route is precisely 2 horrendous miles pre measured with my car. I live in a small neighborhood with many cul-de-sacs and in order to get the miles in I have to go down pretty much all of them. It really isn't very enjoyable, but it is safe at night which is the only time I have to run these days. I paid attention to the watch to see how the fit would be. At first I was super concerned that it would jam into my hand, but it didn't. In fact it was way more comfortable than my Garmin and was light weight enough to forget it was there. The Go Stick was clipped where instructed: on the same hip as the watch and white side facing out. They connected to each other very quickly and the GPS signal was picked up in about half the time of the old Garmin. A great start! As I was running, I kept looking down at it and I will admit that the jaunty angle was super easy to read. I had my head lamp on, so didn't need a back light and the black on white display showed up just fine. The screen showed my pace, time and distance easily enough, but I did miss the lack of beeping at the mile markers. I was happy with it when I finished. Comfortable, light weight and extremely easy to use. It automatically uploaded and by the time I entered my front door and logged in my data was waiting for me. So two thumbs up for ease of use, comfort and both acquiring GPS and uploading data quickly. I was tempted to try the SOS feature, but refrained because Wyatt was sleeping and I didn't know how loud it would be and knew Dusty couldn't come find me anyway. When I logged in though, I was disappointed. The Bia read 2.25 miles which on a suburban route with no clouds and no trees was odd. How could it be that off when everyone else showed screen shots of an almost unbelievable accuracy? Well, here is my screenshot. You can easily see the areas where those extra miles came into play. I don't have sidewalks where I live, so I run along the actual road. While I hoped it would, I did not actually expect it to pick up exactly where on the road I was, but I did expect it to show that I was actually on the road and not running through people's houses. 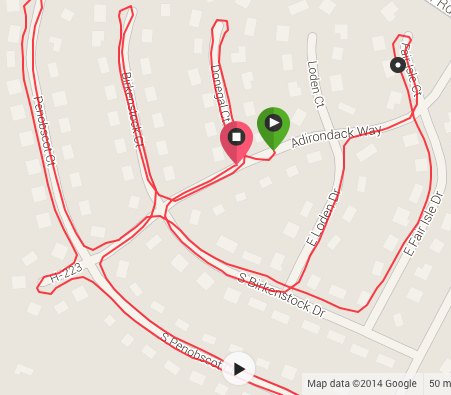 It also apparently thought that I ran past the cul-de-sacs and into yards. 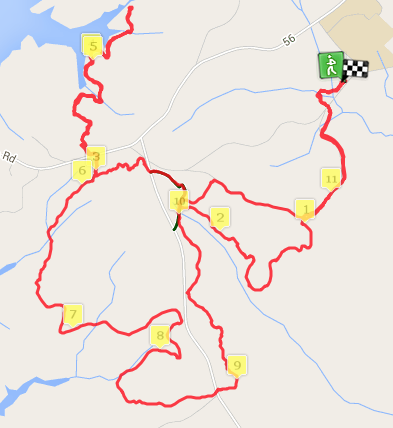 While also not perfect, you will notice that the lines are smooth and it looks like I actually did run this route. I emailed my screenshot to the company and they responded very quickly. One big bonus to an upstart company. The customer service rep said the route looked jumpier than normal and sent it along to the tech team. Well, not to let a good purchase go sour after only one try, I took it out to the woods on Saturday. Unfortunately, I was stupid and took a whole new trail. That meant that I wouldn't have any old Garmin files to compare to. Not smart on my end, but the ride meant more to me than the actual watch. We headed out and I was skeptical of the readings the entire time. I missed my Garmin and knowing how off to plan on. Who knows if it was adding or subtracting miles? For the trails that I know, this looks pretty good. It shows pretty much all the creek crossings and roads accurately and I only see a few spots that make me question it. It is at least smooth and not all jumpy and weird. Maybe it just needed a warm up? Given the two test runs, I'm not sure what to think. The tech guys responded that the first run looks just fine to them and that the additional mileage can be attributed to the cul-de-sacs. Basically they claimed that if I ran to the center and turned around that the miles would be less than had I run around the entire circle. No crap? Really? They say the watch figured I did the circle and I must have only ran to the center and turned around. But they are wrong because I always make sure to run along the outside edge of the circle for the added miles. Sorry, boys but the GPS signal just sucked that night. The rep was really nice and explained that I can use it until the end of the month before returning it for full money back. An upgrade to the software should be out prior to that and may make the data better. She also thinks an update rolled out between my run and ride which may be why the run looked crappy and the ride pretty. I am going to use it out on the neighborhood again tonight to see how it compares to the first run. Hopefully it looks similar to the Garmin read out and all my concerns can go away. Otherwise, if it remains sketchy I will just return it. The only reason to shell out the cash was for an upgrade to what I already have. If it isn't going to be much better, than it isn't worth the money. Very very interesting. Keep the updated reviews coming! I'm eager to hear more! !